Nina J. Romano was born on May 8, 1923 in West New York, New Jersey to Angelo and Grace (nee Bille) Alessi. 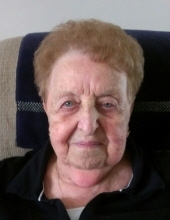 She died peacefully on Tuesday, April 9, 2019 surrounded by her loving family. Mrs. Romano worked as a Bookkeeper throughout her adult life for many industries. Her first job was in New York City, to which she commuted by ferry and bus from her NJ home. During WWII, Nina took on a second job at Macy’s at Herald Square in the evenings where she would tag merchandise alongside of other young women who had boyfriends and husbands away for military service. Her last position before retiring was Head Bookeeper for the Fort Lee, NJ Board of Education, where she managed the books and payroll for over 500 employees. Nina loved to embrace others as family, and over the years had crocheted hundreds of Afghans, scarfs and baby blankets for everyone her life touched. She was a compassionate, kind, generous woman who was selfless in her relationships. Nina was strong in tough times, and was always the one that family and friends leaned upon. She was always grateful for all she had, and always demonstrated this by giving her understanding, time, wisdom, love, kindness and generosity to those less fortunate than her. In her early retirement years, Nina and her husband John lived in Clearwater Florida for 9 years. They loved to travel and went on dozens of cruises to many destinations. While in Florida, she loved going to the beach and to exercise classes with her friends. She always loved to read and watch TV, especially shows about attorneys, Police officers, and doctors. In her more recent years, she enjoyed watching old movies and every episode of Lawrence Welk shows that she could find. Nina was always interested in current events and read the newspaper every day. Nina’s family was her greatest love and passion. Nina was not materialistic and she truly valued family members as the “Jewels” of her life. Nina is survived by her daughters Stephanie (Gene) Lipow and Renee Romano (Kirby) Nocker as well as her grandchildren Jackie (Terry) Bosko and Justin (Paige) Lipow, and her great-grandchildren Brooklyn Bosko and Brandon Bosko, who affectionately called her "Dee Dee". She was preceded in death by her husband John A. Romano, to whom she was married for 56 years at the time of his passing. Nina is also preceded in death by her parents, Angelo and Grace Alessi, as well as her brother Salvatore Alessi and her sister Conchetta Alessi. Visitation Saturday, April 13, 2019 from 9:00 am until time of Funeral Mass at 10:00 am at St. Edna Catholic Church, 2525 N. Arlington Heights Rd., Arlington Heights, Illinois. Entombment will follow at Memory Gardens Mausoleum, Euclid Ave, Arlington Heights, IL. "Email Address" would like to share the life celebration of Nina J. Romano. Click on the "link" to go to share a favorite memory or leave a condolence message for the family.